The television landscape is littered with spinoffs/sequels/continuations/reboots both good & bad…mostly bad. Logically one can conclude that any series worthy of a spinoff must be pretty good itself, which right away means the new show has high standards that it must live up to, something that oftentimes proves to be difficult. The spinoff needs to provide viewers with a sense of comfort & familiarity while at the same time standing on its own as a fresh and different entity from the original. It’s tricky and usually doesn’t work. However, there have been a handful of notable spinoffs that have achieved a certain amount of success. Sometimes folks forget that a show is even a spinoff, and on rare occasions the spinoff equals or even outshines its parent show. We are going to try something a bit different with this installment of Superfluous 7. For each slot I have listed a good & bad…a yin & yang…a hero & villain. It’s a twofer, a BOGO, a double feature!! But first let me offer a few qualifiers. In all cases I am familiar…on some level…with both the parent series and its spinoff. Y’all know that I love, love, love The Andy Griffith Show, and I am well aware that it is a spinoff of The Danny Thomas Show (aka Make Room for Daddy). However, the only episode of the original show I’ve ever seen is the one that was a “backdoor pilot” for TAGS (you can find it on YouTube) so that particular spinoff doesn’t make this list. Ditto for Happy Days, which was a spinoff of Love American Style, a show I’ve never seen. 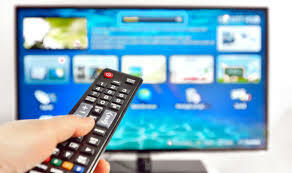 I am also aware of the plethora of spinoffs of shows like CSI, Law & Order, & NCIS, but since I don’t watch those shows nor their “offspring” you won’t find them here. They just aren’t my cup o’ tea. Your mileage may vary and that’s okay. Something else you won’t see here…reality shows. I know that The Bachelorette is a spinoff of The Bachelor, but since I am of the opinion that such programs are contributing to the decay of society they aren’t worth the time & energy to even talk about. Also let me take this opportunity to say that narrowing this list down was harder than I expected. 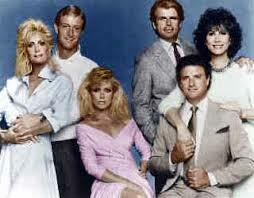 There are shows that I rather enjoy like Mama’s Family (a spinoff of The Carol Burnett Show), Trapper John M.D. (from MASH), Mork & Mindy (one of a few spinoffs from Happy Days), Benson (a spinoff of Soap), Family Matters (a spinoff of Perfect Strangers), and The Simpsons (spun off from something called The Tracey Ullman Show) that just didn’t make the cut. There are others, such as That 80’s Show (a follow-up to…of course…That 70’s Show), Just the Ten of Us (a spinoff of Growing Pains), Flo (a spinoff of Alice), and Living Dolls (a spinoff of Who’s the Boss? notable for kicking off the careers of Halle Berry & Leah Remini) so inconsequential that I’m surprised I remember them at all. At any rate, without further ado, The Manofesto ambitiously presents…..
from the home office in Mount Airy, NC….. In the middle of the second season of Diff’rent Strokes housekeeper Edna Garrett leaves the Drummonds to become the housemother at a private girls’ school in upstate New York. And so The Facts of Life was born. 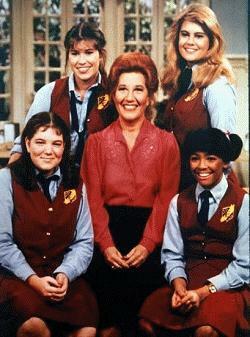 At first we were shown the lives of a large group of students at Eastland Academy (including a very young Molly Ringwald), but eventually the show focused on just four: rich girl Blair, tough girl Jo, funny girl Natalie, & Tootie, who spent most of the first season on roller skates. Facts was one of those sitcoms that didn’t shy away from heavier topics & issues that a typical teenager might face. It was also a very adaptable show, going with the flow of cast changes and realistically putting the four girls in different settings as they grew up. The show was never a ratings juggernaut but quietly stuck around for 9 solid seasons. More than 25 years after it left the air I can still sing (badly) the theme song. On the flip side we have what was intended to be a continuation of Three’s Company. Crowd had Jack Tripper settling down with a lovely stewardess and their relationship being constantly meddled in by her father. Not even the comedic brilliance of John Ritter could save Three’s A Crowd though. It wasn’t all that funny and the cast just never seemed to gel in the way that its predecessor’s had. Three’s A Crowd lasted just one season. Prime time soap operas were a big thing in the 80’s & 90’s. Dallas and Dynasty were the kings of the genre and forerunners to shows like Beverly Hills 90210, Melrose Place, & Desperate Housewives. During the third season of Dallas Jock & Miss Ellie’s middle son Gary Ewing & his estranged wife Val (parents of Lucy Ewing Cooper) reunite and move to a cul-de-sac in California. Friendships, rivalries, business deals, & love affairs amongst the various neighbors were the basis of Knots, which was more grounded & realistic than its parent show but just as soapy. It lasted an astonishing 14 years and survived a plethora of cast changes as well as all manner of ratings competition. 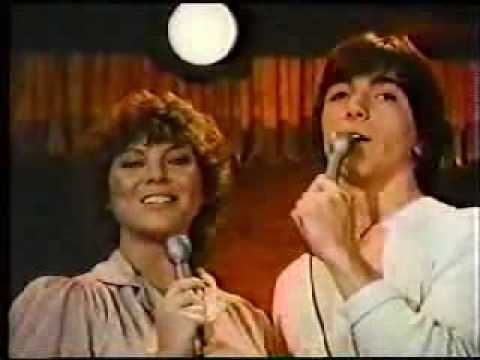 Conversely, Joanie Loves Chachi did not last anywhere near as long. The idea was that the Happy Days lovebirds relocate to Chicago to pursue a music career. But without Ritchie, Fonzie, Potsie, and Mr. & Mrs. C the twosome just weren’t all that interesting. The show was cancelled after two years and Joanie & Chachi made their way back to Milwaukee for Happy Days’ final season. I was fortunate enough to grow up in the 70’s & 80’s when syndicated reruns of popular shows from the 60’s like The Beverly Hillbillies, Hogan’s Heroes, The Brady Bunch, Gilligan’s Island, The Munsters, Batman, The Addams Family, & Bewitched were shown on television a lot. Thank God I was provided the opportunity to appreciate such classic programs that had originally aired long before I was born. One of those shows was a fish-out-of-water spinoff of The Andy Griffith Show that saw dimwitted but good-natured mechanic Gomer Pyle leave Mayberry and enlist in the Marines. 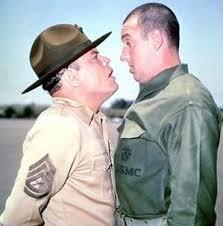 Gomer’s contentious relationship with drill instructor Sgt. Carter was hilarious and his penchant for inadvertently screwing up drove many of the plots. NBC’s The Golden Palace was, much like Three’s A Crowd, a failed money driven attempt at prolonging a show that had run its course. When Bea Arthur decided that she wanted to leave The Golden Girls after its seventh season the powers-that-be simply had Blanche, Sophia, & Rose buy a Miami hotel and build a show around their interactions with the establishment’s staff & guests. Not the worst idea in the world I suppose, but it’s hard to catch lightning in a bottle twice and the concept just didn’t work. The Golden Palace was cancelled after one season but is notable for being one of the early entries on the resume of actor Don Cheadle. The Golden Girls did launch a more successful spinoff called Empty Nest about a doctor and his two grown daughters. Joanie Loves Chachi may have been a bust, but Happy Days did have two successful spinoffs. I liked Mork & Mindy and became a huge Robin Williams fan, but it just doesn’t quite make the cut for our current purposes. 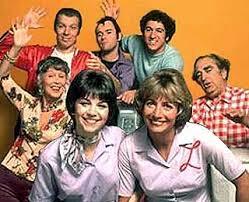 However, Laverne & Shirley most definitely deserves a spot. 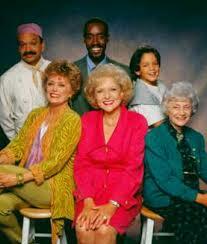 It retained the 1950’s Milwaukee setting of its parent show but otherwise stood out on its own merits. The supporting cast (Lenny & Squiggy, “The Big Ragu” Carmine Ragusa, Laverne’s father Phil & his gal pal Edna) was solid. Laverne & Shirley isn’t one of the greatest shows in the history of television and it kind of limped to a finish in its final two years (the entire cast inexplicably relocated to California together…as if that is realistic…and Cindy Williams, aka Shirley, isn’t even around during the last season), but amongst spinoffs it has to be considered a tremendous success. The prime time spinoff of Saturday morning staple Saved by the Bell, on the other hand, can’t be called successful by any metric one could possibly use. Now let’s be honest…the original show wasn’t a high water mark of artistry or excellence. But for what it was…a Saturday morning show meant to appeal to teenagers…it did the trick. The problem with shows set in high school (besides the fact that the powers-that-be always seem to cast 25 year olds to portray characters that are supposed to be a decade younger) is the fact that they should realistically only last 4 years. What to do with a successful (i.e. profitable) show after that?? Follow the kids to college of course!! It’s been done multiple times and almost always bombs. 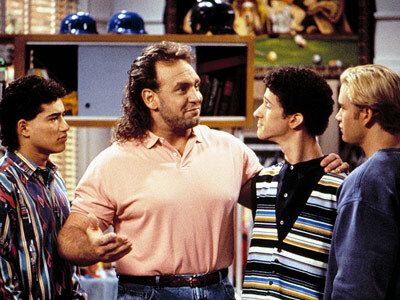 In this case only half the cast moved on to the spinoff and characters were added (most notably a dorm advisor played by former NFL player Bob Golic) that just didn’t pan out. The other issue was that for some odd reason The College Years aired in primetime instead of Saturday morning. Big mistake. The show only lasted one season. I should mention that I didn’t forget about Saved by the Bell: The New Class (although I wish I could) but chose to aim my scorn & derision at The College Years if only because the original cast should have known better. I am a little too young to remember the sociopolitical climate of the mid-1970’s, but I do remember that at the time black folks were still being portrayed in pop culture as poor, uneducated, & usually living in the ghetto. 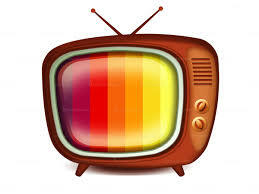 Shows like Good Times, Sanford & Son, & What’s Happening! all seemed to…unintentionally…perpetuate a stereotype that African-Americans (a term I don’t particularly like…we are all Americans) are doomed to a struggling blue collar existence in “the projects”. 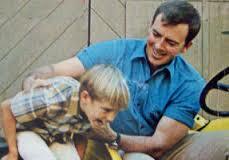 Diff’rent Strokes was about two orphaned boys that only make it out of Harlem because a rich white man adopts them. Even Saturday morning cartoon Fat Albert had the kids hanging out in an inner city junkyard. But George & Weezie Jefferson were different. George owned a chain of dry cleaning stores. They lived “in a deluxe apartment in the sky” (after they’d moved from Queens where they were neighbors of Archie Bunker and thusly spun off from All in the Family). They had a maid and a doorman. 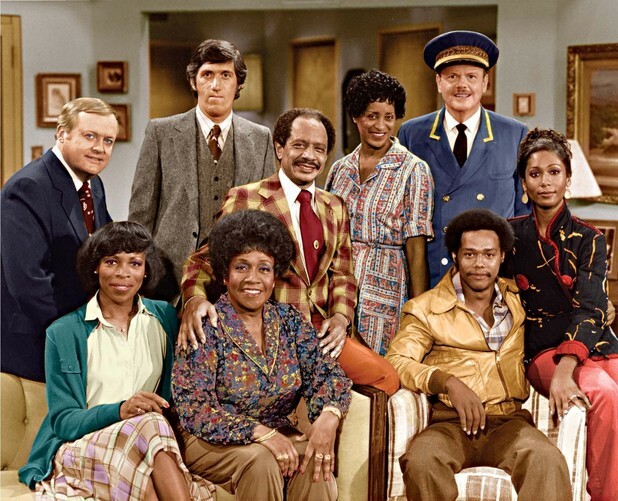 The Jeffersons showed that The American Dream is accessible to everyone. It is a formula that was later followed by shows like The Fresh Prince of Bel-Air, Family Matters, and especially The Cosby Show. On the other side of the coin we have Mayberry RFD, a show still set in Mayberry but missing key elements like Sheriff Andy, Barney Fife, and little Opie. To be fair many of the supporting characters from TAGS were a part of the spinoff. Aunt Bea, Goober, Howard Sprague, & Clara Edwards were all in the cast. However, Ken Berry (who would go on to play the hilariously dimwitted Vinton on Mama’s Family in the 80’s) as farmer & town councilman Sam Jones was a poor substitute for Andy Griffith. Mayberry RFD…in my opinion…didn’t differentiate itself enough from its parent show and instead was a watered down copycat. The show had solid ratings but was cancelled after three seasons as CBS tried to overhaul its image and distance themselves from rural themed shows like Green Acres, Petticoat Junction, & Hee Haw. Oftentimes spinoffs have a “backdoor pilot” within the parent series and usually run either concurrently or immediately following the demise of the original. TNG is odd in that it premiered nearly two decades after the cancellation of TOS. What the two shows…set a century apart…have in common are the starship Enterprise and really cool tales of space exploration and adventure. TNG gets the formula exactly right. There is a certain amount of familiarity that makes the viewer feel as if we are revisiting an old friend, but the characters are not at all carbon copies of their predecessors. Captains Kirk and Picard couldn’t be more different. Doctors McCoy and Crusher are nothing alike. Engineers Scotty and Geordi LaForge?? No. Spock & Data?? Well…maybe just a little bit but not really. As a trifling Trekkie I must say that the TOS movie franchise was far superior to the tepid TNG films, but as far as the TV shows go the spinoff gives the original a real run for its money. I didn’t really follow any of the other Trek shows that came after, but I loved The Next Generation. Conversely, I, like the majority of the population, barely recall that The Love Boat had a spinoff. The Love Boat was a product of its time. It’s not going to rank anywhere near the best television shows, but as Saturday night comfort food in the 1980’s it worked well enough to last a decade. But the spinoff had a few issues that it couldn’t overcome. First off it debuted over a decade after the original bid us a fond bon voyage. 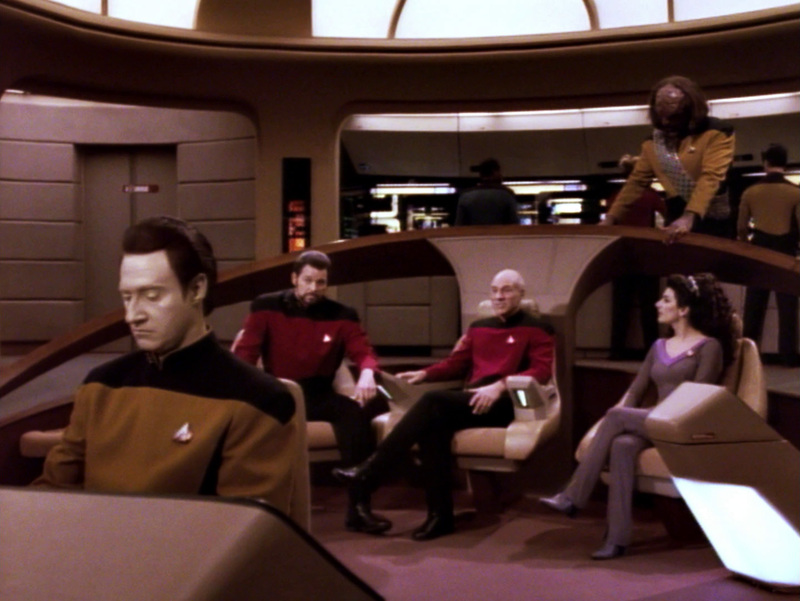 That kind of delay may have worked for Star Trek: TNG but that is the exception to the rule. Secondly The Next Wave aired on UPN, a network that only lasted a decade (in comparison to CBS, ABC, & NBC that have all been around since the dawn of television), never offered a full prime time schedule, and only had mild hits including forgettable shows like Moesha and Veronica Mars. Now I’m not saying that The Next Wave would have been successful on a real network, but it never had a chance on UPN. And much like Mayberry RFD the spinoff tried too hard to be exactly like the original only with actors and characters that couldn’t hold a candle to their predecessors. The concept…perfectly acceptable in the 80’s…was far too trite for the edgier 1990’s. The Next Wave lasted two seasons only because UPN had no better options. There are many people that are of the opinion that Frasier actually outdid its parent show Cheers. 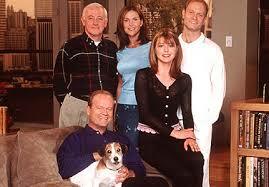 That’s a fun little debate, but amongst spinoffs Frasier stands alone. Rather than try to replicate its predecessor the show took the titular character of Dr. Frasier Crane and transplanted him to a completely new setting and surrounded him with a whole new cast of supporting players that weren’t anything like the bar crowd on Cheers. Dr. Crane himself developed quite nicely as a character without undergoing any drastic changes from what we knew of him as a recurring bit player on the original show. About the only thing the two shows have in common is the superb writing that made me fall in love with both. Frasier is such a good show that it probably would have found an audience and been a ratings success on its own merits, but having a built-in audience of faithful Cheers viewers certainly helped it get off on the right foot though. However the tone of the two shows are so vastly different that I’d be willing to bet that there were a decent amount of Cheers fans that tuned out after realizing the spinoff wasn’t going to blindly follow the trail blazed by its forerunner. If that’s true then Frasier deserves even more kudos for building an audience and lasting 11 seasons…just as many as Cheers. Now when one considers the success of Frasier then it is fair ponder the question of why AfterMASH was such an epic failure (other than its stupid & uncreative title). Afterall, it tried the same thing…transplanting characters from one show and spinning them off into a show that had a totally different setting & tone. So what was the difference?? Well, for one ting AfterMASH took Col. Potter, Cpl. 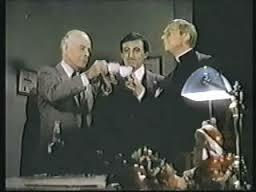 Klinger, & Father Mulcahy from The Korean War to working together at a hospital in Missouri. Whereas Frasier relocated one character in a totally logical way (he moved back to his hometown to be near his family) AfterMASH clunkily reunited three characters in a completely unbelievable manner. It just didn’t work. Otherwise there are a lot of possible explanations. If TV industry people knew why some shows failed and some were smash hits they’d run for political office and fix the nation’s more important problems. AfterMASH actually had decent ratings in its inaugural season (I am assuming due to curiosity from loyal MASH fans) but then crashed & burned in its second season in part due to brutal competition from The A-Team. But if that were the only issue they could have just put it in a new time slot. I think people were just over their MASH love and ready to move forward. The writing and storytelling obviously wasn’t compelling enough for folks to stick around, and when those things aren’t good no amount of nostalgia will keep a show alive. Not only is AfterMASH probably the worst spinoff of all time but it is largely remembered as one of the worst television shows in general.